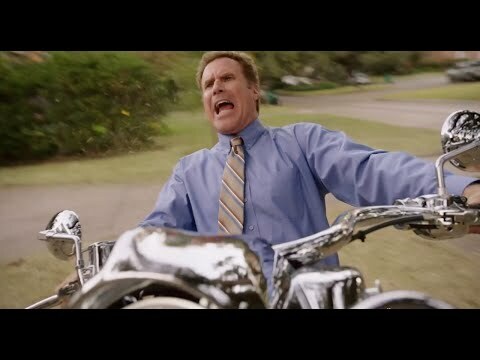 Daddy's Home movie quotes bring the laughs as a straight-laced stepfather goes head to head with the wild and studly biological father of the children. The comedy film was written by Brian Burns, Sean Anders and John Morris. Anders also directs Daddy's Home, which opened in theaters on December 25, 2015. In Daddy's Home, Brad (Will Ferrell) loves being a stepfather to his wife Sarah's (Linda Cardellini) two young children, Megan (Scarlett Estevez) and Dylan (Owen Vaccaro). The kids, however, are not as excited. So when their estranged biological father, Dusty (Mark Wahlberg) arrives to stay with the family, a battle between the dads erupts. Between trying to wow the kids with bedtime rituals and gifts to tests of skill, including some that end with motorcycle accidents and injured Los Angeles Lakers cheerleaders, Brad and Dusty battle for the affection of the children, all in typical comedic form. Daddy's Home hit theaters which were already roaring with other great films such as Joy, The Hateful Eight, Star Wars: The Force Awakens, and Sisters. Brad: I'm a hot habanero pepper right now. Perhaps paying homage to his Zoolander line in which Mugatu, also portrayed by Will Ferrell, declares himself "a hot little potato," Brad describes his current state of mind as a hot habanero pepper. We're guessing hot habanero pepper is a little bit angrier than a hot little potato. Brad: I've always wanted to be a dad and, let me tell you, I love it. Brad: Did you do another drawing of our family? Megan: That's me and Dylan and mommy, and over here, far away, is you. Brad: I love how you drew my hair. Am I wearing a baseball cap? Brad: Well it's well drawn. Brad: Okay, I'm their stepdad. The way I see it, anyone can be a father but not everyone has the patience and devotion to be a daddy. Brad truly embraces being a stepfather to young children Megan and Dylan. Considering Megan drew Brad with poop on his head, it's safe to say she does not share his excitement. Dusty: Take her out. See what she could do. Remember, one down, four up. Brad: Everyone knows it's one down, four up. Ahhh! Watch out! Watch out! Watch out! Dusty: Let's all just be grateful nobody got hurt, okay? Dusty: Right, just stay still. I'll get you. Brad: No, please just go and get a shirt on. In an attempt to show everyone just how tough he is, Brad tries to ride Dusty's motorcycle. Considering it ends with Brad stuck in a wall, let's just say this is a fail. Dusty: The king received word that his dominion was being ruled over with some curly headed step-king with good credit! Brad: Sounds like your dad is spinning quite a yarn. Dusty: Well actually, it's getting late. Brad: Good night, my little magical cherubs! Eskimo kisses! Dusty: Who wants good night tickles? Brad: Good night back scratches! Dusty: Hey, who wants 20 bucks? Megan and Dylan: [together] Me! A simple bedtime ritual quickly turns into a competition between father Dusty and stepfather Brad. When Dusty pulls out cash, it appears that this battle is won.